Living in Michigan has brought about what could be seen as my destined interest in Tim Horton’s coffee. Destined in the sense that it’s a company I’ve been aware of for seemingly all my life, thanks to my born in Montreal father who saw Tim Horton himself play hockey and then became acquainted with their distinct dark and hearty brand of coffee, becoming a big fan and even having a plastic Tim’s cup affixed in one of his car dashboards for a period of time when I was growing up. 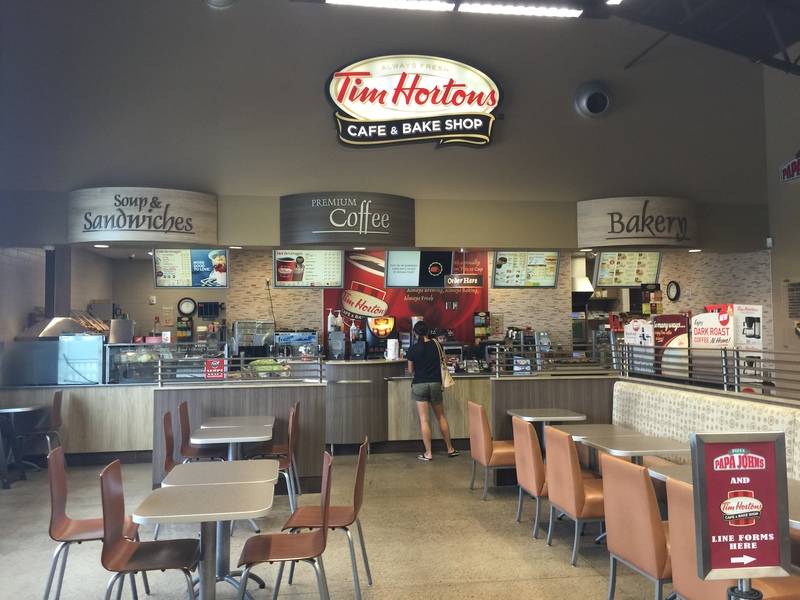 On the couple of occasions that he and I made a point of traveling to Canada, or to Northern New England where the chain had a few outposts, it was a Big Deal to visit Tim Horton’s en route or as part of the trip. So when I first arrived in Michigan nearly four years ago, it was an “oh, yeah” moment of realizing that Tim Horton’s was both in the neighborhood and could be easily accessed over the border in Canada as well. While I initially referred to Tim’s visits as a “making good on the proximity to Canada” – and it was – at some point they became a more regular routine, possibly around my time of living in a building that had a Tim’s on the first floor and thus I came to somewhat over-rely on at times. Since I don’t live in that building anymore, and am now more aware as to which Tim’s locations are more consistent than others, visits to Tim’s have since turned into more of a “Where’s Waldo” or by convenience based experience. This was true today, when I found myself in an area that has multiple Tim’s in close proximity to one another. I chose the smallest of the locations, which I have visited occasionally, and found that they were having an overloaded moment. I ought to have used the backup of cars from the drive through as a sign to go elsewhere, but I was able to get a parking space and went inside. Despite having at least five cars in the drive-through, the interior of the store was COMPLETELY EMPTY of customers. The clerk gave me a harried expression worthy of a novel (his co-workers were hurriedly attending to the drive – through customers) and took down my order. When the order arrived, it became a humorous mistake in that he gave me two sandwiches instead of one (so there’s tomorrow’s breakfast!) and forgot about my drink. When I reminded him of it, it was on the house, since I’m pretty sure I wasn’t charged for it in the first place. Knowing the menu so well at this point – and sticking to more or less the same order – has allowed me to memorize the typical price of things or what is comboed together. The clerk and I exchanged an understanding glance again worthy of a short scene, and that was that. But definitely one of my most memorable Tim’s visits in recent memory, as it veered from the routine and had an element of surprise and unpredictability. Some locations in this metro Detroit area appear to be more familiar with the mocha latte than others, so that contributes to part of my guessing game with the chain, and part of the fun, admittedly, of going back to that original intention of enjoying geographic proximity to our Northern Neighbor. And also making sure that I’m fully alert for the continuing rigors of a busy lifestyle.